This necklace I made with scrap booking paper pasted on small pieces of cardboard. 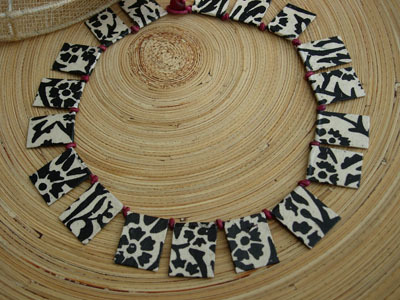 In stead of scrap booking paper I made some similar necklaces with starched papers too. I started this necklace with a big silver bead (I kept this bead from a broken necklace). I completed it with little silver cube beads and paperbeads. I found the paper for this beads in my letterbox. They are made with promotional leaflets with a white background. 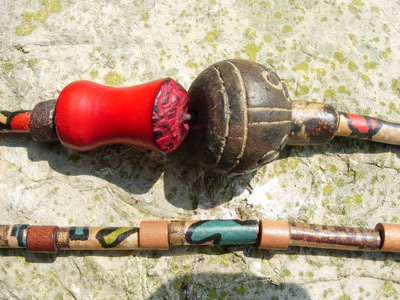 On the other side I put a double string with ancient African tradebeads. They are made of glass. I bougth them in an African shop in Brussels. Here I made a very long necklace (4 times the usual length). It’s very colorful. I made it from magazine papers and I joined a lot of little yellow squares from an old necklace from my mother. I took the picture on a stone in the shape of a heart. The stone is carved. As you can see there are small roses on it. 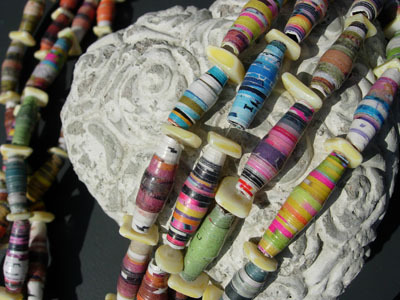 This necklace is also made with magazine papers. 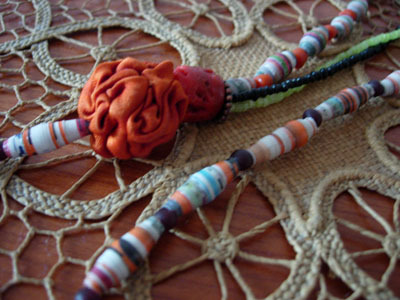 I chose papers with an orange colour in it, so it could be combined with the silk textile bead. A friend of mine made it for me. I also used a big coral and some small orange-red beads. 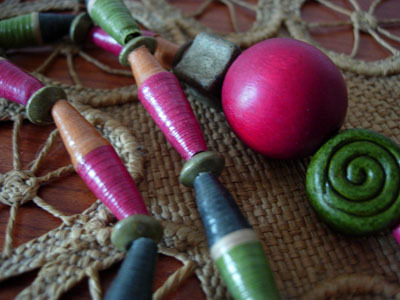 This necklace is photographed on a small raffia tablecloth from Congo (a present from my aunt). It’s made of gift wrapping paper (craft paper with stripes) I used a red spherical and some olive wooden beads from Santorini (Greece). The tubes are made of gift wrapping paper with little colorful figures on it (for a gift for children). I used small wooden beads, and also a very big wooden bead and a red bead (dry vegetable material). We still have room for the Paper Bead Trade, you can sign up by e mailing me your address (Email Me button is on the right hand side). Thank you Hilde, for sharing your beautiful work. 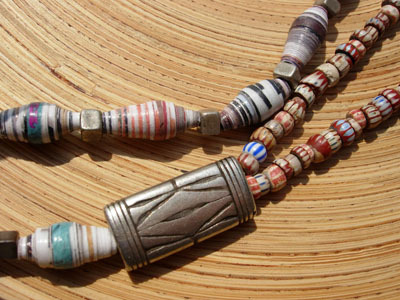 We will be posting ideas and inspiration for the Paper Bead Trade in the next week or so. These pieces are lovely they have such an ethnic look took them, great job Hilde!